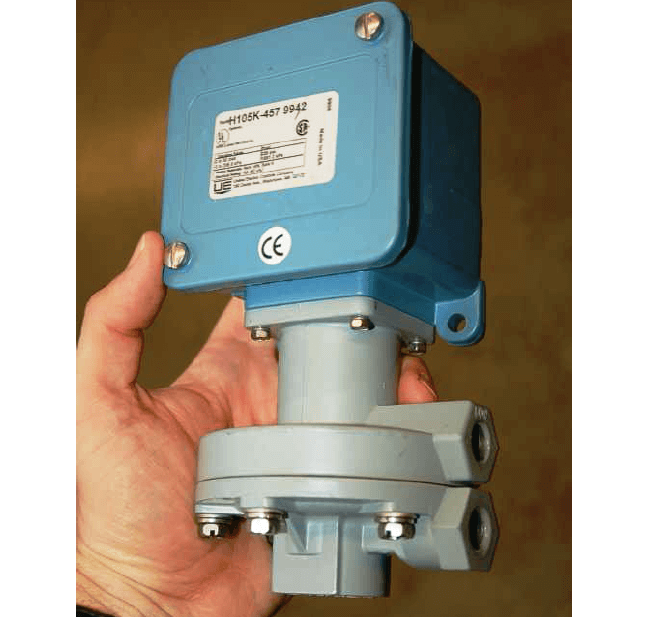 A pressure switch is one detecting the presence of fluid pressure. Pressure switches often use diaphragms or bellows as the pressure-sensing element, the motion of which actuates one or more switch contacts. Recall from Basics of Switches article, that the “normal” status of a switch is the resting condition of no stimulation. A pressure switch will be in its “normal” status when it senses minimum pressure (e.g. an applied pressure, or in some cases a vacuum condition). For a pressure switch, “normal” status is any fluid pressure below the trip threshold of the switch. Advantages of mercury tilt switches include immunity to switch contact degradation from harmful atmospheres (oil mist, dirt, dust, corrosion) as well as safety in explosive atmospheres (since a spark contained within a hermetically sealed glass bulb cannot touch off an explosion in the surrounding atmosphere). Disadvantages include the possibility of intermittent electrical contact resulting from mechanical vibration, as well as sensitivity to mounting angle (i.e. you would not want to use this kind of switch aboard a moving vehicle!). This switch balances the force generated by a pressure-sensing element against a mechanical spring. Tension on the spring may be adjusted by a technician, which means the trip point of this switch is adjustable. One of the settings on this switch is the deadband or differential pressure setting, seen in the lower window. This setting determines the amount of pressure change required to re-set the switch to its normal state after it has tripped. 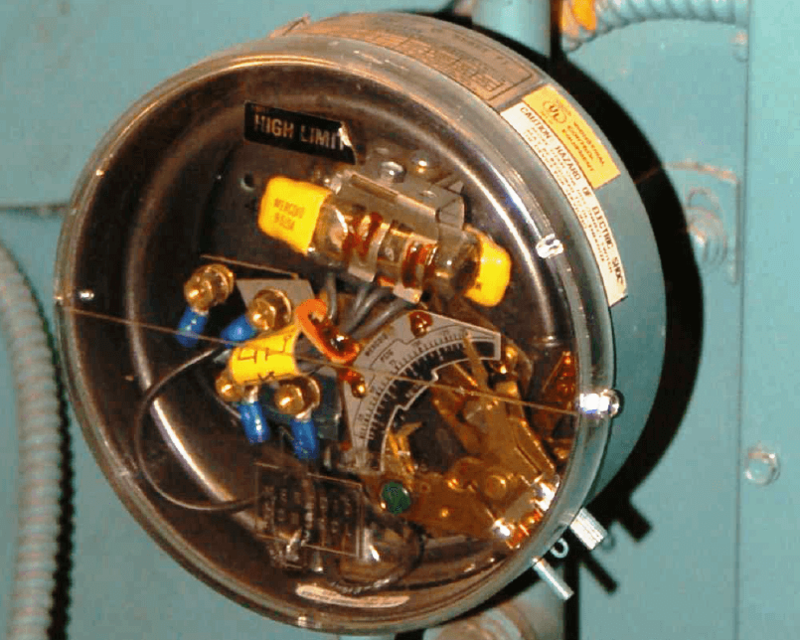 For example, a high-pressure switch with a trip point of 67 PSI (changes state at 67 PSI, increasing) that re-sets back to its normal state at a pressure of 63 PSI decreasing has a “deadband” or “differential” pressure setting of 4 PSI (67 PSI − 63 PSI = 4 PSI). 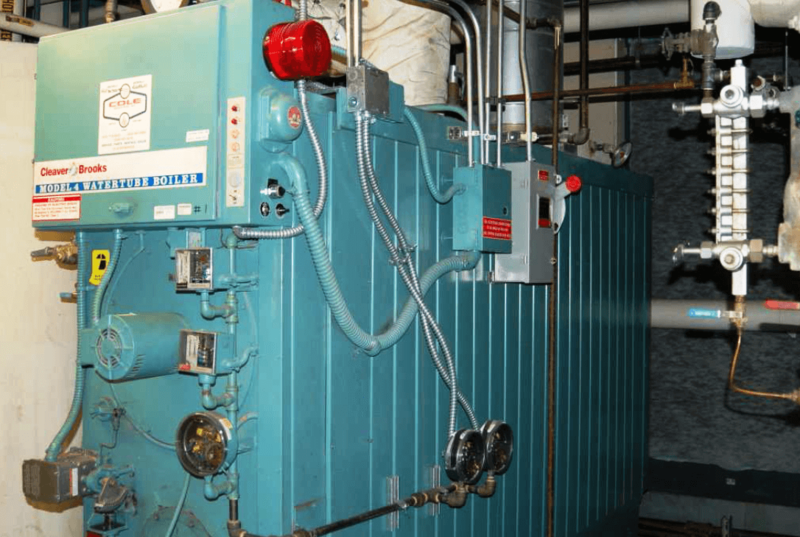 The electrical switch element is located underneath the blue cover, while the diaphragm pressure element is located within the grey metal housing. The net force exerted on the diaphragm by the two fluid pressures varies in magnitude and direction with the magnitude of those pressures. If the two fluid pressures are precisely equal, the diaphragm experiences no net force (zero differential pressure). 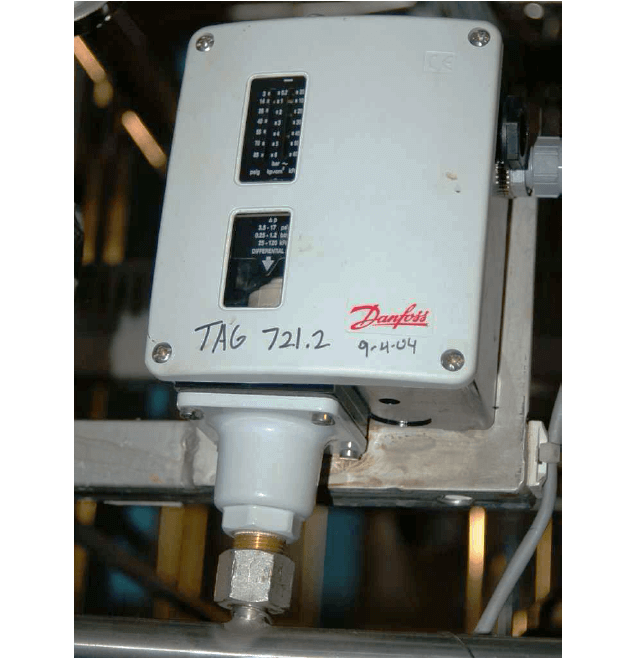 Like the Danfoss gauge pressure switch seen previously, this differential pressure switch has a “trip” or “limit” setting as well as a “dead-band” or “differential” setting. It is important to recognize and clearly distinguish the two meanings of differential pressure in the context of this device. It senses differences in pressure between two input ports (“differential pressure” – the difference between two different fluid pressure connections), but being a switch, it also exhibits some dead band in its action (“differential pressure” – a change in pressure required to re-set the switch’s state).